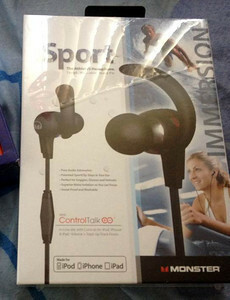 Monster iSport Immersion In-Ear Headphones with ControlTalk - Black is on sale at Amazon right now. I am trying not to regret having bought it during their Black Friday sale (for $67.49, because it's now only $60). I am posting about the headphones here though because hubby is just really so happy with it. He appreciates the waterproof part but LOVES the sound quality of the headphones. Therefore, I am recommending it to those whose loved ones use their iPhones to exercise.